Regarding all this Chrysler bankruptcy stuff – I think the industry is outmoded. And as much as I like companies like Honda, I think the private motor car industry itself will fail as we know it in the next couple decades. But I was questioned as to characterizing the current recession as being on the order of magnitude of a “reset.” Of course it will not reset to zero. And I think that we will “even out” this year. But afterward, the growth pattern will be flatter. The last bubble that deflated was actually a 20+ year super-bubble, and things like the real estate bubble and tech bubble were actually sub-bubbles on its surface. I do not think that we’ll be able to achieve the levels of sustained growth that we and our production mechanisms have become accustomed to over the course of the last generation (the “Privatization Generation”) and that the new landscape will be one of rapid inflation and deflation of individual world markets based on fleeting and transient fortunes. So – on a worldwide scale it will look like a slightly rising line, because there will be growth, but economics will reset to being more of a zero sum game where fortunes are made and lost rapidly. In effect, economics will become what it always has been – gambling. Every successful business will look more or less like a startup or a boiler room, making the money while it’s there to be made, withering after they’ve taken it. Knowing when to walk away, knowing when to run. The fact is that private automotive technology and the “prosperity” that has brought was a prime concern based only on the overlapping interests of a few despotic cabals (oil companies, oil producing nations, steel companies, car companies, finance companies, “workers’ ” unions, pork barrel senators, suburb developers) and as each of these is in turn failing or being brought back to reality, the paradigm will shift. The kings of the wild are not the 4000 pound elephants, too big to fail; but the flocks of 100 forty pound birds of prey. The many, small, fast, and deadly, not the massive and imposing. There’s a reason the military is ordering more Predator drones, not B-1 bombers. The true thing that made us powerful as a nation is that Yankee Ingenuity that says to go with what works, whatever that may be. There won’t be any more GMs who set a standard for a single product. There will be very small transitory companies and GEs, P&Gs, and Sonys – companies so diversified that their individual branches can grow and shrink as necessary. Companies who are not a product, but a management mindset that allows the strong to survive and does not waste sentimentality on the failed ideas that it cut loose. I think that the private automobile is going the way of the B-1, of the steam engine, and of the brontosaurus. It is built on an ecology of plentiful resources, and the asteroid that will end all that is hitting as we speak. It’s awesome, in such a significant (symbolically, if not economically) moment that he won’t pull the punch. Sure, it plays well, but that’s the point. This whole automotive industry thing is about PR, not actuality. American self-concept. Once we admit we’re not a nation of makers anymore, we cede the territory that turned us into a superpower to … well, to China. I’ve been thinking lately of what this all means – what if it’s getting to be impossible to make money on building cars? What if all the honest efforts of environmentalists to find a new path separate from an automobile based cultural identity actually don’t kill the car. What if market economics themselves kill the car? I’ll take it by any means. I’m sure I’ll be accused of being even more cynical than the factory owners I “critique” for this. But here goes. This is / was a particularly hilarious email discussion going on in my office… And remember it’s all in good fun, folks. This is the school I’m (hopefully) going to. Let me know any inventive ways you guys paid for school. Because I was going to be shouting my own manifesto from a roof anyway. And I love being paid in beer. So… being paid in beer for shouting my manifesto from a roof is not to be missed at any cost. Then, at the suggestion that I become a gigolo and find a “sugar momma” (an idea still on the table, by the way), I produced this email explaining my theory of how to choose said sugar momma. So… I’m thinking of following your suggestion and becoming a kept man. Here’s a helpful graph. The line is the cutoff, as long as I stay in the white, I’m good. I might be able to see her assets differently. See, Russ? If she’s worth about $50M, Duane would be OK with that. Another example, Susan Bolye, that unemployed, 47 year old virgin, who was a singing contestant on the “Britain’s Got Talent”, becomes rich and famous, and has $500M by the time she is 50; Duane is all over that, too. Like I said, with $500M, Duane is all over that! Susan Boyle is a joke… the only reason people are impressed with her singing is because of their preconceived notions based on her appearance and demeanor. I’ve known many average looking people with far more talent… the joke of a magazine culture and the media that feeds it continues to create false idols. I think my feelings on the matter of the singer can best be summed up in a touching scene from this week’s South Park. Which brought about me – getting entirely too serious about things. As a singer, I’m sure she’s wonderful. And of course, in a sentimental sense, it’s nice to see someone who looks more like us than the typical media circus performer succeed at the spectacle. But she is even more a product of that value system than the typical performer. Television studios and television productions are total environments. Every element is under strict control. If a strain of the outside gets in – for example if a member of the lumpen consumertariat breaks the fourth wall in the other direction – you can damn well be sure it was manufactured. At least insofar as the terms of the situation were set up so that the outcome would be a “spectacular” product saleable to the viewer, not an honest challenge to (or at least hacking of) the system of production. If you’ve had 47 years of experience to pull yourself together and you are going to be on national television, a bit of an eyebrow pluck and your sunday best aren’t too much to ask, are they? This was played for dramatic effect more cynically than even your typical clash of the media gladiators out for Caesar Cowell’s thumbs-up. Now – who’s on the next plane to Mogadishu with me? hey- that ugly english woman doesn’t look anything like me. mogadishu? thinking of funding the AA through robbery on the high seas? Welllll…. how far would you go for architecture, Russ? Because an extremely dangerous life in a failed state, swashbuckling and being a menace to international trade is a compelling way to make a fortune, so that I can go shout manifestoes from rooftops and get paid in beer! What (a) Difference a Day Makes? In the last 24 hours I have paid off my computer and filed a statement of intent to register with UCLA. And hopefully soon I will be paying off my most abused credit card. The wheels are turning, turning. Today is Earth Day. Good. That’s all you’ll get out of me on Earth Day. If our whole society weren’t acting like children who don’t understand that if you eat the whole cake you’ll eventually crash from the sugar high, there wouldn’t be we wouldn’t need an Earth Day. The internet is stale. The whole damn thing. Dry as a bone. Nothing new has happened in quite some time. Years. And these feel like the doldrums before a big storm. So I’m pulling up stakes with the current mode in preparation for something new, which feels inevitable. What that means is that I will be keeping up my flickr and no matter how trifling what I have to say is – even if it’s just a link – I’ll be making a concerted effort to update here on my “blog” daily. And that’s about it. The internet has lost the spark of the new, the feeling of outlaw territory that used to be ubiquitous, and until it has something good to say, I’ll be sitting on the sidelines. Email me your address if you want me to write you a letter. I just found a parallel of my Deadvertising Project lurking in plain sight. As a matter of fact, it’s more a separate piece of the lifecycle of Deadvertising, and one of which I have many examples already. This means I should clarify terms. This is Zombie Advertising. Thanks to Scouting NY for the info here. 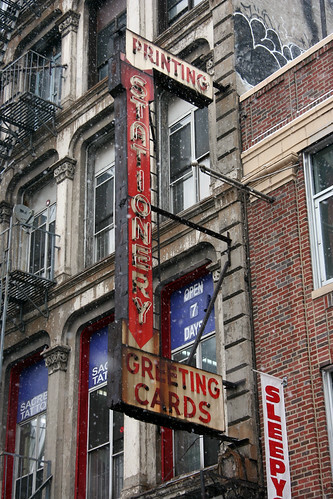 This delightful stationery store signage has outlived its store. It is all signifier, with a complete absence of signified. Deadvertising focuses on conditions that are signs, formally; but have lost their intended corporate content by the loss of the literal symbol. So they are blank, broken, or often “vacant” – eg the only signage is information for future renting. 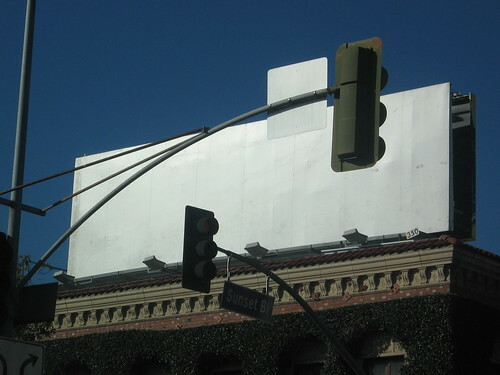 Zombie Advertising focuses on conditions that are signs, with their literal symbol still attached. So where Deadvertising is significant for the absence of symbol, Zombie Advertising is significant for its lack of symbolized. No matter where this train of thought goes, this distinction will be present – and when I have time to focus on doing so (eg – not now), I will build a small classification structure. So thank you to Scouting NY for the inspiration!